St. John’s has a parish room available, complete with fitted kitchen and toilet facilities which is used frequently for a number of varied uses, i.e. Polling stations, exhibitions, and events. It will accommodate up to 100 people. 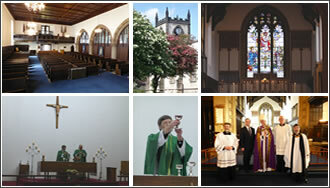 All Saints is a church of contemporary style and is available for hire and used on various and numerous occasions. It has kitchen and toilet facilities and will accommodate up to 100 people. Both premises are available to hire at £20 per hour.